We all have our insecurities with our bodies. Whether that’s crooked teeth, a flabby stomach, or hairy arms. It seems like there’s always something we could change about ourselves. When you are constantly chasing after an unrealistic version of yourself, you begin to lose sight of who you are right now. Filling up with self-doubt, because you aren’t proud of who you are at the moment. Not until you lose 15 pounds or have longer hair. Why is it that we find it so hard to accept who we are right now? Without learning how to love & accept your body, you can start to hate everything about who you are. And once you convince yourself you have so much to work on and change, it becomes that much harder to let go. What Causes Body Image Issues? There are a variety of things that can affect your body image. Society teaches us at an early age that what we look like is important. And how attractive we are determines our value to others. Which is how you can become obsessed about how you look and how much you weigh. So, how can you learn to accept and love your body as it is right now? If you have become very used to ignoring what your body needs, this could be a challenge. You might think you “have” to go to the gym every day and eat super healthy to have the right body type. But, that’s not what everyone needs on a daily basis. Sometimes, you need to rest. When you learn how to listen to what you need, over what you “should do”, you learn how to accept yourself. Stop ignoring your body. Stop forcing it to do things it doesn’t want or need. Listen to what it’s telling you. Become more in tune with yourself, and you’ll stop listening to everything else. Your weight and body do not define who you are. They make up a part of you, but there is so much more to who you are. Sure, some people care more about what you look like than how you act as a person. But, those people are shallow. Stop hanging out with those people. Focus on being a great person, caring for others and practicing kindness. You will bring in so much positivity and support into your life, and you’ll forget about how important your weight is. Because honestly, how much you weigh doesn’t mean anything. Living a life you love, without obsessing over your body is what matters. Learning how to love & accept your body is confusing. There are so many rules that people make up. I swear anytime I go online, I find someone trying a new diet or venting about why diets don’t work. It’s a messy little world. And with so much misleading information, it’s how we begin to binge eat and become anxious around food. Eating food shouldn’t have to be this complicated. Break this cycle in your own life. Stop making it so complex and focus on simplicity. Eat when you’re hungry. Eat what you want in the moment. Eventually, by letting go of this terrible cycle, you will learn how to eat intuitively. Which means you know what your body wants, and fill it with what it needs, at the times it needs it. Then, after a while, you will stop feeling so uncomfortable about food. Because food isn’t the enemy, it’s just what everyone makes up in their own minds about it that is. The time I feel most comfortable in my body is when I spend time with it, totally naked. Sounds weird, I know. But, you have to work with what you’ve got. Embrace the fact that you have a body. With working muscles and organs; a body that is giving you the ability to breathe right now. You might not always enjoy it, and it might piss you off sometimes. That’s ok. My boyfriend pisses me off a lot, but I still love him. Even if it’s just in the shower, play some music and dance a little bit. As you shave your legs, look at your body and appreciate it for what it is. Be grateful for your curves and all of the beautiful things about it that are only unique to you. Comparing yourself to others is a time waster. Especially since, if you really look around, everyone else has their own insecurities. Just because they have a flat stomach doesn’t mean they aren’t insecure about their nose. We all come with insecurities, and things we wish we could change. So, let go of comparing yourself to others. In all aspects of your life, not just with your body. It’s pointless and it doesn’t get you anywhere. And, there are things about you that other people are envious of. Learn how to love those things about yourself, be grateful for what you have, and focus on more important things. Dieting always feels like a Catch-22. You go on a diet to lose weight, and avoid all of the bad things you normally eat. Then once you’re done with the diet, you feel a little better and might have lost a couple pounds. But, you can’t stop thinking about the foods you used to eat. Then, you eventually give in and tell yourself you’ll get back on the diet next week. Why is this such a normal thing to do? Does telling yourself “I’ll start my diet on Monday” help you validate yourself for eating the foods you consider bad? And who determines those foods are “bad”? Dieting is more of a mental thing than anything. You convince yourself you need to do it to feel better about yourself. To stay on track and so no one can say you are unhealthy. But, it’s having a strong negative impact on your body image. Let go of dieting! Stop doing it! If you want to focus on eating healthier, do that. Don’t restrict yourself and get sucked into the diet fads. Stop thinking about all of the things you want to change about your body. Think about what you already have. A big booty? Strong legs? Arms that allow you to do anything? Get down to the basics and be grateful for just having a functioning body. If your weight is the only issue you have with your body, there are soo many other great qualities about your body that you’ve made invisible in your eyes. Take a look in the mirror and evaluate the cool parts about yourself. Practice this often, so you can start to see all of the good things within yourself. Eating the right food for your body will make you feel great and energized to take on the day. This doesn’t mean only eating vegetables. Think about the foods you really love, whether it’s a vegetable, fruit, or pizza. The foods that just make you feel good and happy. Work on bringing these foods into your diet. Get rid of the food you eat just to be healthy. If you don’t like it, don’t eat it! It’s all about moderation and balance in your diet. Something I personally enjoy using is this guideline from MyPlate. It tells you how much food to have on your plate for a balanced meal. Then, I modify it from there. If I want to have dessert, I have some. This way, you are getting the right nutrients for your body, but you aren’t obsessing over calories or avoiding carbs. Stop trying to do everything and be super woman. You already are super woman. If you feel constant pressure to look a certain way, it will break you down eventually. And trying to please or impress others is an impossible game to win. It just causes too much stress, and it’s totally unnecessary. Take a break and focus on the things you can control right now. If you’re really concerned about your body, work on letting it go. That could mean practicing meditation techniques to slow down your breathing. Or, it could mean taking a nap. Try to relax for a little bit and go easy on yourself. And if you can do this often (like every day), you’ll learn how to relax and stop caring so much about what your body looks like. That inner critic of yours always has something to blab about. Always talking you down and making you feel like you’re not good enough. Well, it’s time to pull your inner critic to the side and have a heart to heart. Confront your inner demons and tell them to stop harassing you so much. Those negative thoughts piling up in your head are what make it so difficult to accept your body. You have to quiet them down, and stop listening to everything they have to say. Your thoughts are a part of you, and they are the most convincing. Ignoring them isn’t the easiest thing to do. But, whenever you hear your inner critic rambling on, tell her to just be quiet for a little bit. Replace those bad thoughts with good ones. And if you don’t love those parts, tell yourself you “accept” them. That way, you can learn to be ok with who you are. Acceptance is what will bring peace in your life. Trying to change everything and fix every flaw will only bring chaos. Work on accepting the things you know you can’t change. Even if you think you can change them, let it go. Don’t try to fix everything. Because, there is no such thing as perfection. You can always work on improving yourself and growing, but don’t try to change the parts that make you you. You don’t have to love every part of your body but work on accepting it. I promise that learning acceptance will put you on the right track to enjoy your life more without obsessing over all of these things you cannot control. All of the social media platforms out there have an unrealistic view on what the real world looks like. Instagram is notorious for making things look way better than they are. Anyone can filter a photograph or pose at a specific angle to make themselves look slimmer. Don’t believe everything (or anything) you see on social media. Most people only post the good times. Nobody likes to talk about the bad times, because they don’t think anyone will accept them if they don’t appear perfect. If you follow a lot of people who have unrealistic profiles, look for the more realistic ones. Not using social media or following accounts that are completely irrelevant to body image is what I’d recommend first. I like these ones, just because they use their accounts to promote imperfections. Which, in my opinion, is a lot more beautiful than trying to be something you’re not. Putting your body to work can help you appreciate what it can do. It can be anything, like going to the gym, going for a run, playing outside with your pup, or a leisurely walk. You don’t have to do intense exercises to be healthy. Moving your body will help clear your mind and release endorphins, which give you energy. Sometimes, sitting around all day can make thoughts about ourselves worse. That’s why doing something where your body is moving for a few minutes can really help. Caring too much about what you look like can make you lose sight of everything that’s already in front of you. Like, all of the things you are working hard at achieving in life. I bet that when you look back on your life, you won’t want to remember all of the times you were obsessing over how you looked instead of enjoying the moment. Like ones that actually make you feel good? Is that having a big family one day, or getting to travel the world? Where is your calling you too? These are the things you have to put first, not what you look like. Focusing on what’s most important to you will help you accept yourself “as is”. Because being at the perfect weight won’t matter as much as the adventures you have in life. Also, once you learn how to focus on what is more important, it just gets easier to love your body. How often have you told yourself “I just need to lose 20 pounds, then I’ll be happy”? This is a lie a lot of us tell ourselves. As a way to make the current situation better. We just think our lives will change dramatically once we make more money, lose weight, or become successful. These things are what drive a lot of people. But, most of the time we are always chasing these things, and never getting to a place where we are content. One of the best things you can do for yourself (and your sanity) is to start ignoring all of these things. You won’t reach a point in life where your problems magically disappear. Things happen, which means change is the only constant thing in your life. Losing weight or changing the way you look won’t make you feel any happier. It’s just not how it works. It starts with you, and how you feel about yourself and your life. If you can work on that, you will learn how to be more content and appreciate everything in your life. You have thoughts built up in your mind about what you should look like. And when you repeat them to yourself, you really believe they are true over anything else. Work on retraining how you think about yourself. Retraining your brain can help you see yourself in a completely different light. We are our own worst enemy sometimes, but it doesn’t have to be that way. You can learn to love yourself, if you truly want to! And if you find it hard to do yourself, it never hurts to look into therapy. That way you can meet with someone who can work with you on properly retraining your brain to think more positively. You are who you are right now for a reason. Trying to change your body to look a certain way will make you feel like you don’t matter enough. Looks are not everything, and a lot of people will look deeper than that when trying to get to know you. So, stop trying so hard to change the parts of yourself that make you so special. Focus on the stuff you enjoy in life, and finding balance. Getting too wrapped up in what your body should look like will bring on obsessive thoughts that are hard to get rid of. We become obsessive because it’s not natural to be so focused on losing weight and being thin. It’s not what we were on the earth to do. Spend time taking a step back and figuring out what your values are. Let go of everything else. Because when you do this, you let go of the obsessive feeling. And learn how to live a life you love. Did you enjoy this article, or have any questions? Leave them in the comments below! 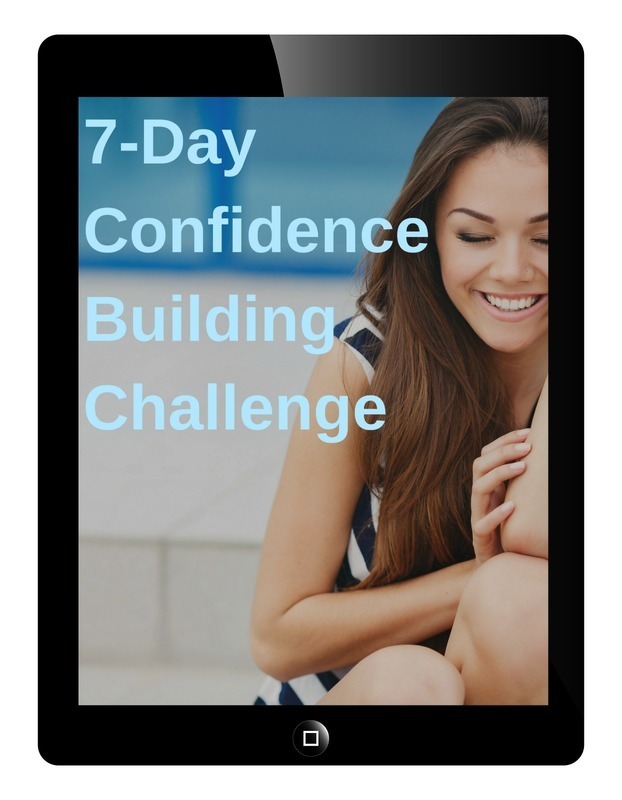 Overcome insecurities, feel better about yourself, and finally have the courage to go after what you want with this 7-day challenge.